From AquaLawn, AquaTurf and Aquatech to Rainmaker, Rainscapes and RainScapes (with a capitalized ‘S’) to Advanced Irrigation Systems, Advanced Landscape Irrigation and Advanced Sprinkler Systems. I could keep going but I think the point’s been proven: most irrigation businesses sound the same. So with hopes to spruce up the industry’s future, here’s some inspiration to help you find a unique name that makes your business stand out from the crowd. And if you already have a name you can still learn some random knowledge for pub trivia or beating your friends and family at Trivial Pursuit. 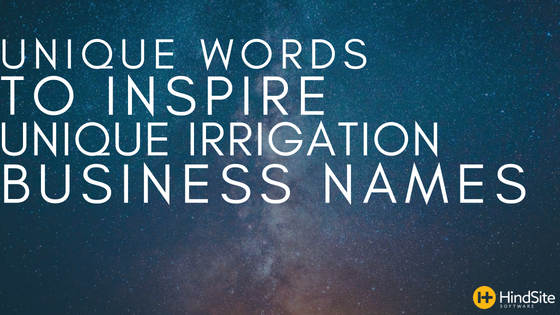 My favorite irrigation business name comes from one of our friendly customers up in Canada: Rain Gods. That - right there - is an objectively cool name. It’s fun to say. It exudes power through and through - in every letter, in every syllable. It also helps they have a logo that’s the easiest on the eyes. And a beautiful website that has a squeaky clean design. So expanding off of our northern neighbors, we gathered some cool (and cool sounding) mythological water and rain deities from around the world. And considering water covers 71% of the Earth it’s no surprise ancient mythology is filled with them. Hinon: Iroquois god of thunder. Thor: Before all of those Marvel movies, Thor was the Norse storm god of thunder, lighting, protection of humanity, strength, fertility. Now he’s just some Australian actor. Zeus: You’ve probably heard of him, he’s the Greek storm and sky god and king of the gods. Ladon: a one hundred-headed Greek sea serpent who guarded the western waters. A freaking monster with a 100 heads? Sounds like a pretty cool logo to me. Tohil: Patron god of the K’iche’ (indigenous peoples of the Americas and one of the Maya peoples). Tohil’s main function was that of a fire deity and was also both a sun and rain god. Jaguar: was the Animal manifestation of the rain deity for the Olmec religion. Lono: Hawaiian deity associated with fertility, agriculture, rainfall, music and peace. If you weren’t feeling the mythology thing and - for some reason - you’re still reading here’s a random assortment of unique water-related words.